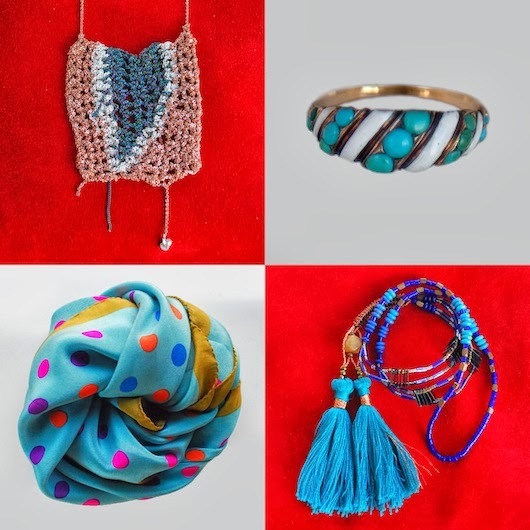 Lovely items in the shop or online for your queen of hearts. New arrivals daily, in-shop exclusives. Metier, 210 Post Street at Grant Street, Suite 1012, San Francisco. 415 590 2298. Open Mondays and Thursdays - Saturdays from 12-6pm, or by appointment, happily! 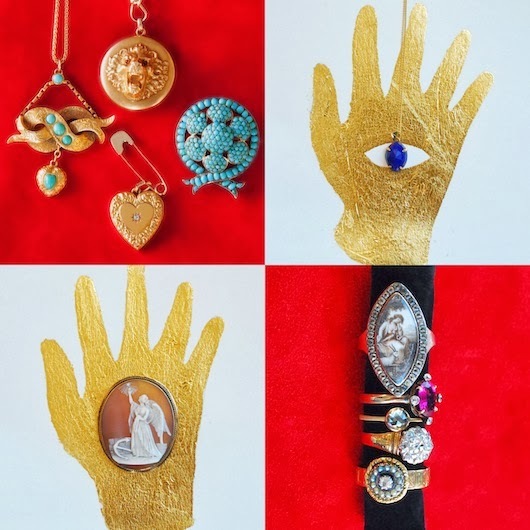 Antique Gold and Turquoise Ribbon Pendant $1075, Victorian Lion Locket $750, Antique Pave Turquoise Pin $950, Conroy & Wilcox 14k Safety Pin Earring $280, Victorian 14k Heart Locket w/ Diamond $525, Conroy & Wilcox Lapis Lazuli Pendant $850, (rings) Georgian Ivory Portrait Miniature Ring $1750, Victorian Pink Tourmaline and Diamond Ring $885, Conroy & Wilcox 18k and Grey Diamond Ring $4450, Antique Rose Cut Diamond Cluster Ring $2550, Georgian 18k Diamond & Pearl Ring $850. Arielle de Pinto Tiger Stripe Drop Necklace $315, Victorian Turquoise and White Enamel Striped Band $750, Epice Silk Square Scarf in Sky Polka Dot $158, Ariel Clute Tassel Necklace.